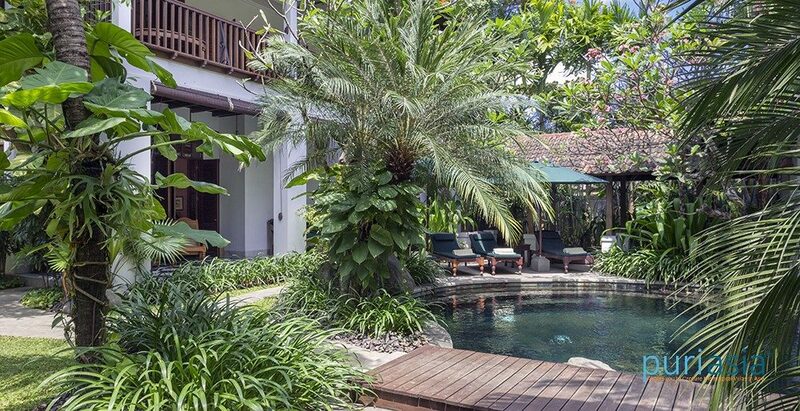 Villa Batavia is a fully staffed five-bedroom villa that counts Asia’s grandest heritage hotels as its strongest design influence, whilst including all the hi-tech facilities a twenty-first-century guest demands. 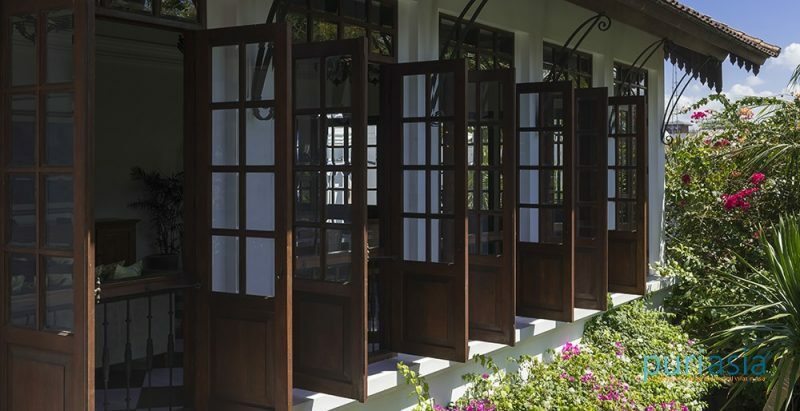 Designed by acclaimed Balinese architect Putu Edi Semara to the exacting standards of its Swiss owners, Villa Batavia’s colonial architecture is evident in the whitewashed exteriors, chequerboard marble vestibules, colonnades, shaded verandas, high ceilings and tall shuttered windows. Throughout the villa, art deco furniture and prized antique pieces stand on polished teakwood floors burnished with oriental carpets. Copper bathtubs, brass fans, Tiffany lamps, rattan pieces and bevelled or stained glass panels deepen the heritage feel. 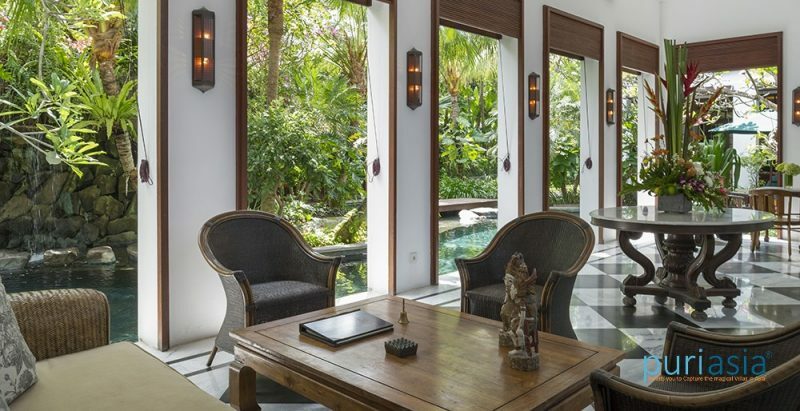 And every surface is a canvas for the owner’s eclectic collection of objets trouvés– framed postcards, maps, letters, engravings and ceramics – that celebrate Indonesia’s rich heritage. There’s an abundance of more contemporary luxuries too: Sonos music system with a comprehensive music library, Bose speakers, home theatre system, iPod docks and HD TVs in every room and WiFi in every corner. Smartly uniformed staff – unobtrusive yet at-the-ready provide the most refined, round-the-clock butler service: no need to lift a finger (other than perhaps to ring the brass bell provided). An espresso with your morning paper in the balé? 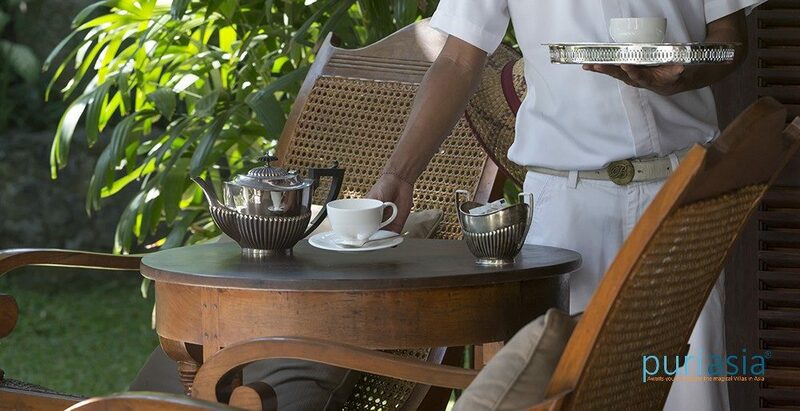 Afternoon tea on the veranda served in an heirloom tea service? Sundown cocktails stretched out on an old plantation chair? A gourmet dinner with silver-plated cutlery and the finest white bone china? A post-dinner cognac and cigar at the sea-breeze-cooled bar before retiring to four-poster comfort in your air-conditioned suite? 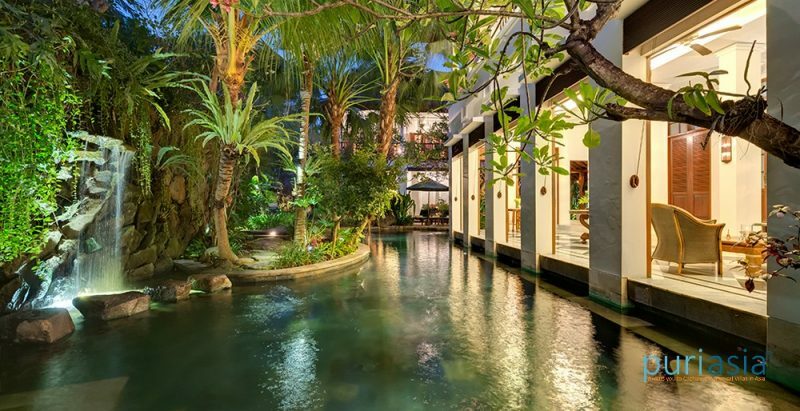 Located within the elite Laksmana Villas estate an easy stroll from the beach and Bali’s best restaurants, bars and boutiques, Villa Batavia also accords families and groups of friends a privileged ringside seat for Seminyak’s sophisticated day-into-night scene. 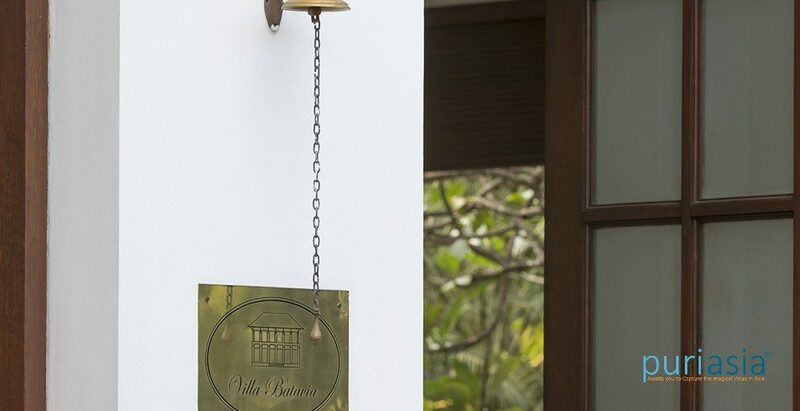 Villa Batavia offers five large bedrooms – four with handsome four-poster beds and walk-through wardrobes (2 king and 2 queen beds), a fifth with twin beds. 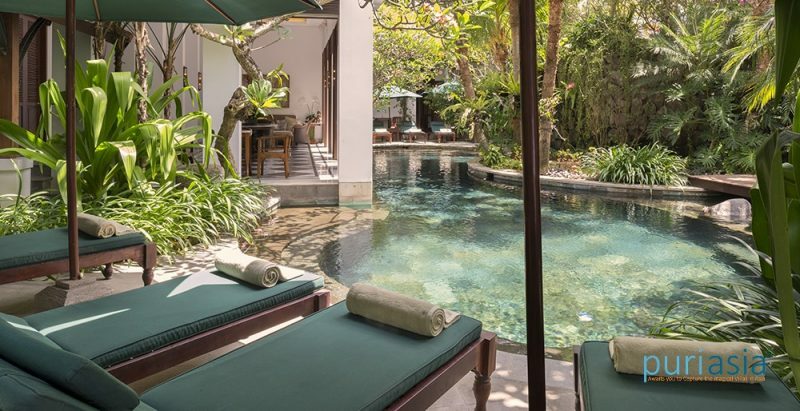 They feature oriental carpets scattered on polished teakwood floors, walls lined with fascinating colonial-era prints and artefacts, and shaded verandas looking over the pool and garden. Balancing the heritage-style interiors are more contemporary touches – mini-bar fridge, safe deposit box, cable TV and DVD player, and Bose iPod dock. There’s air-conditioning throughout and among other comfort-inducing features are top-range mattresses, crisp cotton bed linen, kimonos and slippers. All the ensuite bathrooms are air-conditioned, with teakwood and non-slip acid-etched marble floors, double basins and separate privacy cubicles for shower and toilet. The master bedroom suite occupies the entire second level of the master wing, and encompasses a large bedroom, adjoining study room, walk-through wardrobe and dressing area, and palatial ensuite bathroom with statement copper bathtub. 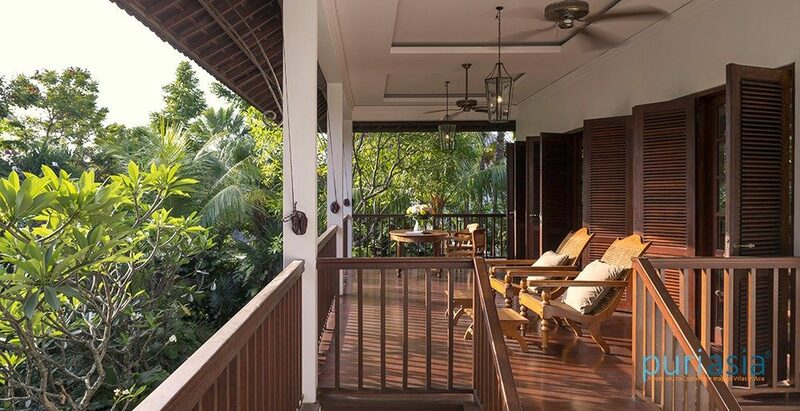 A teakwood veranda runs the full length of the suite, with relaxation areas. Downstairs is a second master suite with veranda opening onto the garden, and a twin bedroom with ensuite – perfect for the kids. 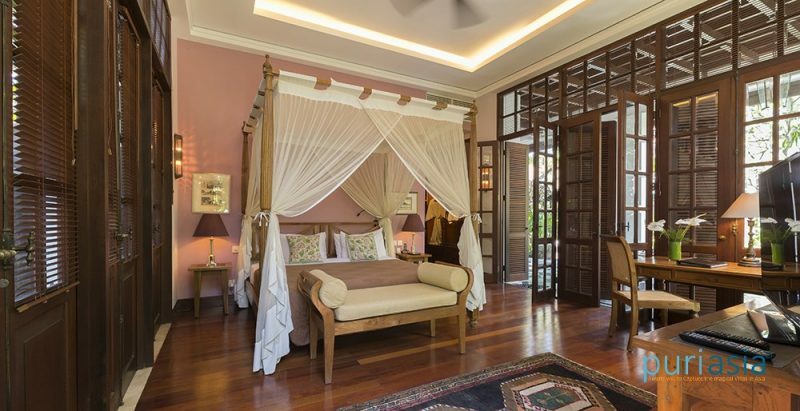 Two more guest bedroom suites in the guest wing offer cool, comfortable interiors enriched with handsome furniture and heritage accents (including a hand-crafted stained glass window) and a shared veranda spilling onto the poolside sun terrace. 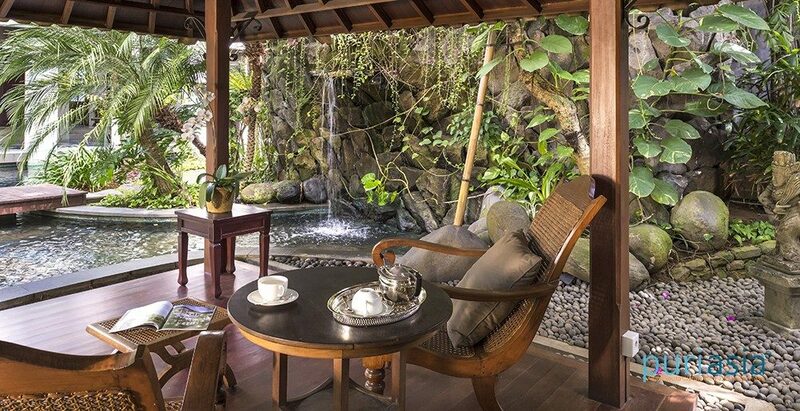 Villa Batavia’s main living areas are on the second level, positioned for Bali’s famed sunsets, cooling sea breeze and peaceful garden vistas – with clear-day glimpses through the treetops of the island’s distant volcanoes. The principal open-plan living and dining room with the option of air-conditioning or ceiling fans, strikes the perfect balance between formal and informal entertaining space. A grand dining table beneath original Javanese chandeliers is the focus for dinner parties of up to ten guests, prepared in the fully equipped, state-of-the-art kitchen close by. Elsewhere, burnished leather sofas and chairs cluster round an antique cabinet hiding a huge flat-screen TV and surround-sound home theatre system. 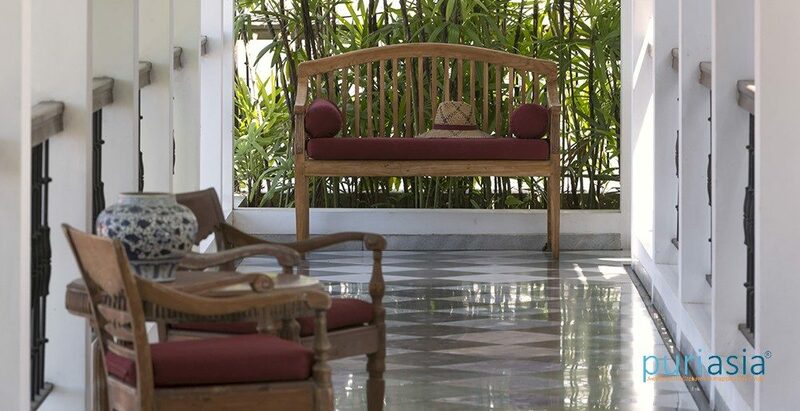 A favourite area is the colonial-inspired open-sided bar and lounge on the second level of the reception pavilion – the perfect spot to retreat with a good book, enjoy an afternoon siesta or linger over sunset cocktails. 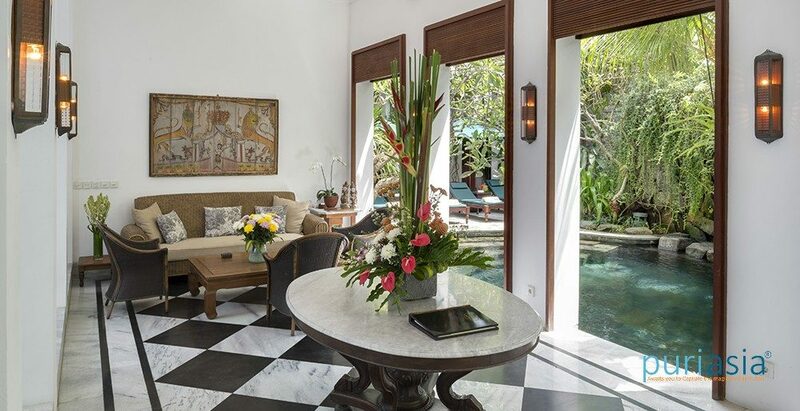 Below is the formal reception hall – an elegant space opening straight onto the swimming pool where guests are greeted with a fresh juice and frangipani garland. 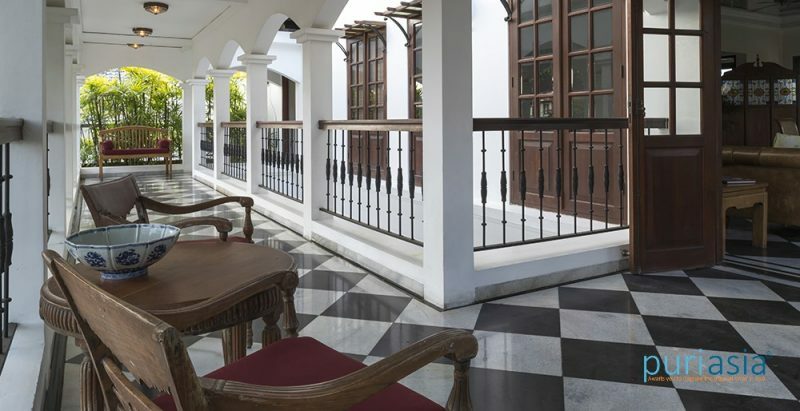 From here, the striking chequerboard floor of black granite and white marble tiles sweeps through the grand colonnaded corridors, according additional intimate seating areas. 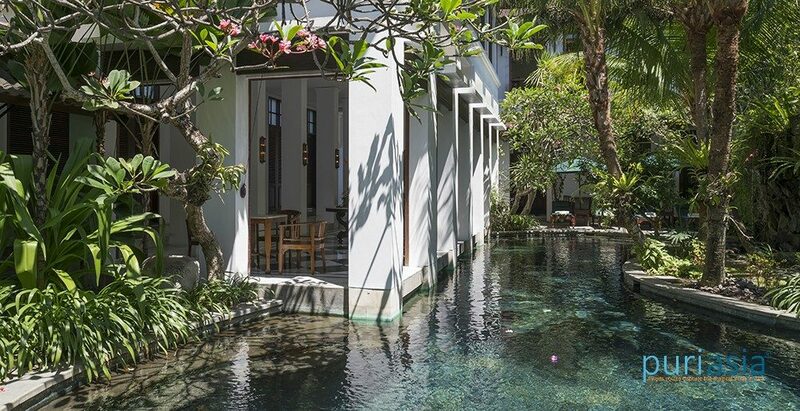 By the 18-metre river-inspired swimming pool (with soft-on-skin saltwater system) are several sunbathing terraces with loungers and parasols, and a traditional balé well placed for blissful massages and romantic candle-lit dinners. 10 people (5 bedrooms: 4 ensuite with king-size beds, 1 with twins); 2 extra folding beds (with additional charge). Reception room; bar and lounge; living and dining room; bedroom terraces; indoor dining for 10; garden balé with dining for 6. Villa staff team includes manager, chef, cook, butlers and gardener. Security provided for the estate. Additional staff (eg. babysitter, driver, masseuse, yoga teacher) available on request at extra charge. 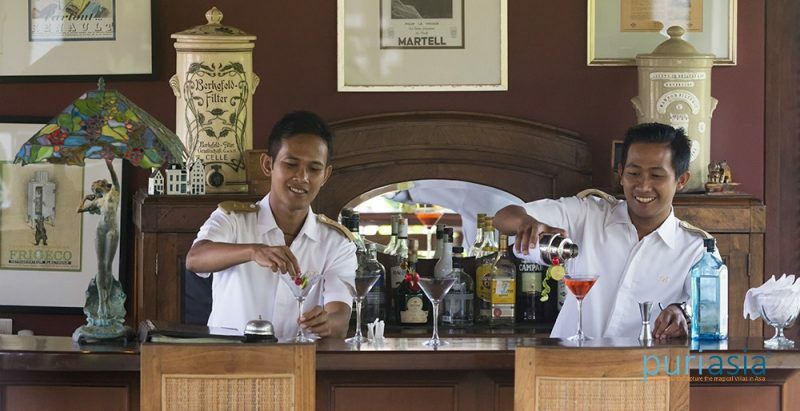 An extensive individually priced menu of Indonesian, Asian and western cuisines; cocktails, spirits, wines, champagne and cigars; off-menu requests (including special diets) accommodated. Wi-Fi broadband internet access; telephone for charged local and IDD calls; printer and fax. Satellite TVs (42-inch or 47-inch in the bedrooms); 52-inch TV home theatre in living room; DVD players; 5 iPod docks; Sonos music system with Bose speakers. Villa Batavia is well equipped for families. Barbecue; in-room safes; full back-up generator; 6 yoga mats; 2 massage tables. Events for up to 20 seated guests, or 40 for cocktails, can be held at the villa with prior notice. The rates are subject to 15.5% service charge, taxes, etc. Please note the above rates are valid until 05 Jan 2019. Please email us if you would like to make a booking after this date.